A government-formed panel tasked with saving the Leadbeater’s possum is hopelessly conflicted and has already discarded proposals to change logging practices that are driving the animal to extinction, conservationists have claimed. Documents seen by Guardian Australia show the Leadbeater’s Possum Advisory Group has picked a swath of conservation options including the installation of nest boxes, releasing possums outside their known habitat and even constructing artificial trees using 3D printing technology. But the group has angered environmentalists by failing to consider winding up VicForests, the state logging agency, or shifting timber production to plantations, away from sensitive old-growth areas. There has been no suspension of logging in these areas during the group’s work. The advisory panel was created by the Victorian government in June, with the task of devising a plan to save the Leadbeater’s possum alongside a “sustainable timber industry”. The species, which is Victoria’s faunal emblem, is perilously close to extinction, with remaining animals living in pockets of old-growth forest in the central highlands region of the state. However, the composition of the panel has come under fire, with each of its members affiliated with either the government or the logging industry. Robert Green, the chief executive of VicForests, is on the panel, as is Lisa Marty, the chief executive of the timber industry body VAFI. Jenny Gray, the chief executive of Zoos Victoria, Bill Jackson, chief executive of Parks Victoria, and Bram Mason, chair of the Leadbeater’s possum recovery team, make up the rest of the group. Steve Meacher, a member of the Leadbeater’s possum recovery team, which was set up when the possum was listed as endangered, told Guardian Australia that Mason shouldn’t be its representative because he is a government employee. “I don’t have anything against Bram at all, but we should be chaired by someone with more independence,” he said. “We need someone who can express opinions to government without fear or favour, but at the moment Bram is coming to us telling us what the advisory group is thinking, rather than the other way around. He’s not really representing us. The Wilderness Society has written to the government voicing its objections to the process, saying the advisory group’s terms of reference are too narrow and favour the logging industry. 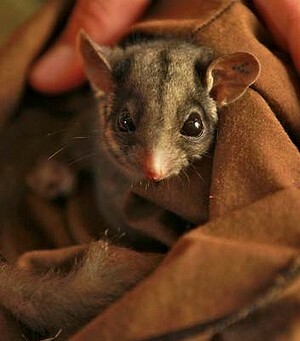 Young said the group needed to embrace the recommendations of the Australian National University ecologist David Lindenmayer, who has proposed a move to plantation timber, a new protected area for the Leadbeater’s possum and buffer zones between logging and known possum habitat. Data relied upon by the advisory group has been contested by conservationists, with the extrapolated estimate of between 4,000 and 11,000 remaining Leadbeater’s possums differing markedly from Lindenmayer’s surveyed estimate of up to 2,000. The logging industry says the primary threat to the possum is fire, with the 2009 Black Saturday fires scorching nearly half of the species’ habitat. It’s estimated that just 1% of old-growth forest remains in the central highlands region. The Victorian environment minister, Ryan Smith, has been contacted for comment. Perched 25 metres off the ground upon a mountain ash tree, Hannah Patchett's new home lacks the luxuries enjoyed by most 20-year-olds. But the bright red treehouse, high in the Toolangi State Forest 80 kilometres north-east of Melbourne, was designed for a purpose - to highlight the plight of Victoria's faunal emblem. 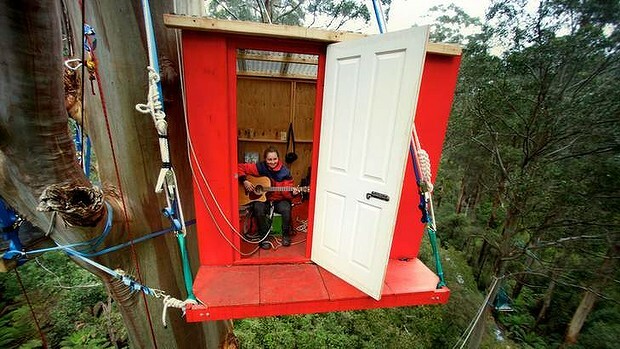 The spartan treehouse is located in a small pocket of old-growth mountain ash forest that forms vital habitat for the critically endangered Leadbeater's possum. ''I'm calling for an end to logging in the area, so that the Leadbeater's possum has a chance at avoiding extinction,'' Ms Patchett said. She has pledged to remain in the 14-square-metre home until the state government announces plans for protecting the endangered creature. 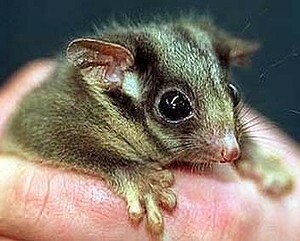 The Department of Environment and Primary Industries lists logging as a threat to the marsupial's diminished population. The deadly Black Saturday bushfires also ravaged about 45 per cent of a 30,500-hectare reserve, established in 2008, in which the possum lives. With the possum population on course for another severe reduction, the state government in June set up an advisory group to aid population recovery efforts. Environment Minister Ryan Smith announced $1 million in funding to implement proposals stemming from the group's ideas. Richard Denniss, Executive director of the Australia Institute. Neither a $6 carbon price nor a direct action fund of $3.2 billion will minimise Australia's impact on dangerous climate change, Richard Denniss writes. Do you think cars are better than planes? What about apples? Are apples better than sandwiches? It is hard to answer some questions because they don't make much sense. Take our political debate about climate change, for example. Do you think we need a price on carbon or do you support direct action? I struggle with that question more than most seem to. To be clear, I absolutely think that we need a price on carbon, but we could do with some direct action as well. Surely I am allowed to want both? Until recently the ALP, the Greens and most of the big environment groups were fans of direct action. Of course it wasn't called direct action then, it was called ''complementary measures'' and the environment movement loved them. But the fact that the ALP and Greens used to support direct action by another name does not mean the Abbott government's scheme will work. It does, however, make the current debate about whether people are on the ''side'' of carbon pricing or direct action a bit silly. The main reason that direct action has a chance of working is that it doesn't actually have to do much. The carbon price deal between the ALP and Greens ignored the scientific evidence in locking in a target of only a 5 per cent reduction below 2020, an unambitious and unscientific target that the Coalition shares. Australia's emissions had begun to fall well before the carbon price came in and before direct action was even a twinkle in Tony Abbott's eye. In fact a significant slice of our new target comes from the ''surplus'' we generated by exceeding our 2010 target. That is, because we did ''too much'' emission reduction pre-2010, we don't have to do as much in the lead-up to 2020. And then there is the high dollar and the devastating impact of the mining boom on the competitiveness of our manufacturing industry. We have already seen two aluminium smelters shut down in recent years and Ford has said it is leaving. As more smelters and car factories close, our emissions fall. When the carbon price could be blamed for such closures it was a national tragedy, but when the miners cause such job losses via the exchange rate, it seems we just call it progress. The high dollar is also killing off the last of the export woodchip market, which has for decades been subsidised to turn old-growth trees that sequester carbon into woodchips for paper and cardboard. The fact that we are now chopping down far fewer trees means that our emissions are far lower and, in turn, Labor's 5 per cent target is easier to achieve. Next is the spectacular inefficiency of our electricity market. Despite the promises that the deregulation and privatisation of our electricity industry would lead to lower prices, the retail cost of electricity has surged by more than 100 per cent since 2007. The inefficiency and profitability of the electricity market has driven far bigger increases in electricity prices than the deepest of deep greens ever hoped a carbon price would deliver. In turn, households and businesses have reined in their demand for electricity. Finally, consider the ALP's successful direct action policies. Schemes such as the renewable energy target and subsidies for rooftop solar panels have delivered a flood of renewable energy capacity which, contrary to popular belief, is putting downward pressure on the price of electricity. It is also significantly reducing the amount of coal we need to run the airconditioners and clothes dryers that we tell developing countries we can't live without. There are, of course, some clouds on Australia's emission reduction horizon. The massive expansion of our coalmining industry and coal seam gas industry will generate big increase in ''fugitive emissions''. That is the methane that escapes when fossil fuels are being extracted. Another problem for the Abbott government's plan to achieve a 5 per cent emissions reduction without a carbon price could be the exchange rate. If the exchange rate falls and the manufacturing sector rebounds strongly, so will our emissions. A problem that no doubt some in government hope they experience. Even if the carbon price is not repealed and we move to a floating carbon price in 2015 as planned, the carbon price would fall to about $6. And of course big polluters get 94.5 per cent of their pollution permits for free, meaning they would pay an average carbon price of 33 ¢ per tonne. Let's be clear, a carbon price that low was never going to be the driving force in a ''transition to a low-carbon future''. While a low carbon price is better than none, the ALP's complementary measures or the Coalition's direct action were always going to have to do a lot of the work required to hit the 5 per cent target. Similarly, if the Coalition botches the design of its direct action scheme then it may struggle to deliver on its promises. So what should they do? The biggest problem with direct action as it has previously been described is that it could be an administrative nightmare. Hundreds of thousands of small and medium-sized businesses asking for grants to cut their pollution will take too long and cost too much to administer. But, if the Coalition is strategic, it could buy large chunks of emission reduction at relatively low cost and, importantly, with low transaction and administration costs. The most obvious targets for such a strategic approach would be the logging and forestry sectors. Paying small amounts of money to discourage the chopping down of trees would actually be cheaper than the large amounts of subsidies we currently provide to the same industry to chop down trees. There is big scope for cash flow-positive investments in energy efficiency in commercial buildings. The government should start with the massive stock of Commonwealth buildings and then start some conversations with the state governments. Similarly, state governments own a large stock of public housing that was ineligible for previous efficiency policies, such as the Rudd government's insulation subsidies. Dealing with the states allows the Commonwealth to significantly reduce its administrative costs. Abbott and John Howard have said plenty of things that suggest they neither understand nor are concerned by, the scientific evidence about the need to massively reduce greenhouse gas emissions. The decision to scrap the carbon price suggests the Coalition cares as little about economic advice as it does about scientific advice. But, that doesn't mean that a $6 carbon price was going to tackle climate change. Nor does it mean the Coalition will inevitably fail to meet the ALP's 5 per cent target. Neither a $6 carbon price nor a direct action fund of $3.2 billion will get us within cooee of that level. For an uplifting experience, visit an old-growth forest - only 1880 hectares remain in our Central Highlands and soon there will be even less. We need a hero to stop the chainsaws, someone to tell politicians there is more to Victoria than the Great Ocean Road or penguins; that they are the custodians of the world's largest flowering plants, more impressive than California's General Sherman - Earth's bulkiest and most visited tree; that our forests are the planet's best for storing carbon. About 40 animal species depend on old-growth tree hollows. Thus our hero needs animal management skills as well as economic and political talent. A former vet trained in scientific logic would be ideal, it is up to you, Dr Napthine - a park for all, not woodchips for a few. The Victorian Government is being taken to court by a tiny environment group on behalf of four endangered species. The aim is simply to make the government obey its own laws. IT WOULD HAVE BEEN ABOUT three weeks ago when Tony Brindley last heard that distinctive crackly cockatoo call — a cue to shoot his gaze skywards. "You've got to be alert and know the call they make," says the 72-year-old, before mimicking the throaty staccato screech of the glossy black cockatoo. "When he flies his tail fans out. As he moves through the trees you see this flash of red." For more than 40 years Brindley has been visiting the Wallagaraugh area of East Gippsland, but as time has moved on the birds' numbers have dropped. In 1995, it was listed threatened in Victoria. Now, he'll only spot the "glossy blacks" three or four times a year — sometimes gliding between the trees and sometimes quietly perched, pecking at a seed pod of their favoured black she-oak trees. But since May, this characteristically shy bird has been perched beside three other threatened species in a legal case brought against the Victorian State Government by small volunteer-run conservation group Environment East Gippsland (EEG). Lined up with the glossy black are the eastern she-oak skink, listed as threatened in 2000, long-nosed potoroo, listed in 2002 and the large brown tree frog listed the following year. "It was an act of desperation," says Jill Redwood, coordinator at EEG. "These species have been evolving for millions of years but are being snuffed out because of reckless government. We had to do something because nobody else was." When species are listed as threatened under the state's Flora and Fauna Guarantee Act, the legislation calls for "action statements" to be drawn up "as soon as possible" to help protect them. The case aimed to force the government to follow its own rules and draw up action statements. In 2009, a Victorian Auditor-General's report found that of the 653 species then listed as threatened, "less than one-half have had an action statement prepared, and only a handful of these action statements have been reviewed and updated." A follow-up report in 2012 by lawyers at Environmental Defenders Office Victoria (EDO) found there had been little improvement in the intervening years. 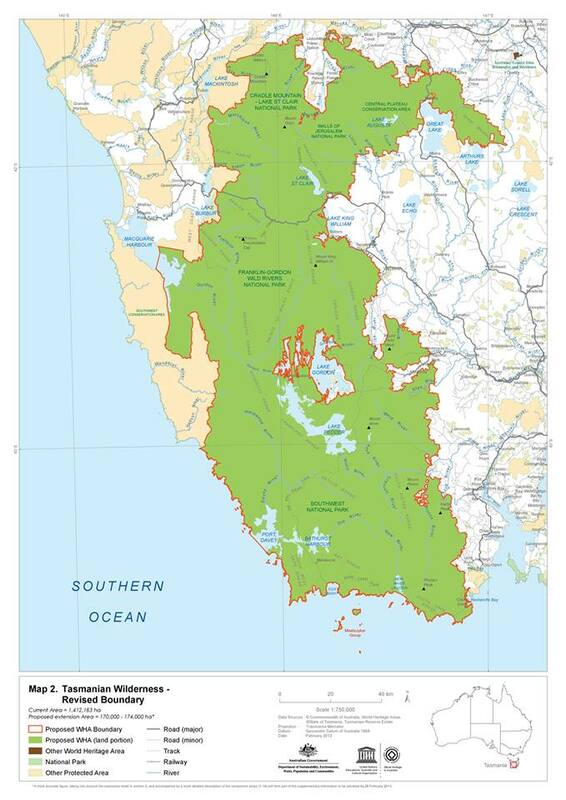 Felicity Millner, principal solicitor at EDO Victoria which is administering the case for EEG, says: "We chose these four species in particular because of their importance for East Gippsland — a lot of the remaining habitat for them is in East Gippsland — and they're all affected by native logging. "Action statements are supposed to set a plan to ensure a species is conserved. It looks at their status and what needs to be done in the future. "It's as a result of the government failing to comply with its own laws that this case came about." ABC Environment understands both the government and EDO Victoria have been working towards a possible settlement, avoiding a scheduled Supreme Court hearing in late October. Rena Gaborov, 39, is a conservation manager from East Gippsland who has studied the small marsupial the long-nosed potoroo — a distant relative of the kangaroo. She admits to being a fan. "They are so fast and cryptic. Their main defence is to hide in dense understory vegetation. You could live around these animals and never see them," she says. "An amazing thing about potoroos is that they specialise in eating truffles. They're somewhere between 30 and 60 per cent of their diet." She says the trees have an important symbiotic relationship with the underground fungi and the potoroos help to spread the fungi spores. She says burning, logging and development has fragmented and damaged the potoroo habitats. "They just slowly disappear and there are all these local extinctions of populations going on and we don't know how that affects other more isolated groups. We need a lot more monitoring and research," she says. The legal action is the third taken by EEG in recent years. 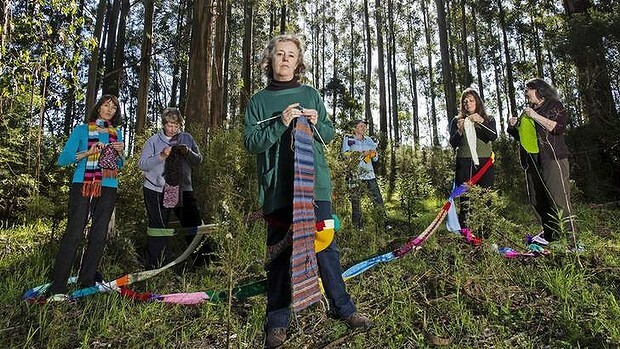 In 2009, the group successfully took Victoria's state-owned forestry company VicForests to court over attempts to log in areas of habitat for threatened species. The court also awarded EEG more than $500,000 in legal costs. In 2012 EEG again launched legal proceedings against VicForests over plans to log in and around supposedly protected rainforest areas. VicForests denied that any areas were ever under threat. The case was settled out of court. "The government just seems to be shameless in the lack of respect for their own laws. Going to court is the only thing we can do," says Redwood. "It shouldn't be left up to the public to force the government to abide by it's own laws. It's just an absurd situation. "I suppose the Government needs to change — but then this has been going on for decades. Unless we take up arms we will have to keep relying on groups like ours and the rest of the community to hold the government to account." A statement from the Department of Environment and Primary Industries confirmed there were 689 species, communities or processes (such as pollution of waterways or removal of species) that did require action statements. Of these, the department said 60 per cent had either been "drafted, published or were due for review". The statement said: "DEPI is working hard to increase the number of action statements and is working closely with scientists, species recovery teams, government agencies and community organisations. High priority statements have been identified." The statement added the department was "committed to producing priority action statements" for the four species in the legal case and these would be released progressively between 31 December 2013 and 30 June 2014. "Most importantly, DEPI is also focussed on taking action and putting in place practical, local solutions to protect these valuable species by supporting the recovery of threatened species and investing in research for effective management solutions." The statement also said a program to control foxes had "led to an increase in sightings of the long-nosed potoroo in far East Gippsland, and progressive efforts have been made to protect the stands of the glossy black cockatoo habitat." VicForests operating procedures for East Gippsland, the statement added, also meant trees could not be harvested within 100 metres of "any identified nesting tree" of the glossy black-cockatoo. A taskforce trying to protect Leadbeater's possum from extinction has begun battling the complex challenge of determining how to balance logging and conservation in Victorian forests. The possum, Victoria's endangered faunal emblem, lost almost half its habitat during the Black Saturday bushfires of 2009, and scientists say the timber industry is putting the rest at risk. A government-appointed taskforce led by Zoos Victoria and logging leaders is holding meetings on Monday and Tuesday. It will then draft its recommendations on how to support the recovery of the possum while sustaining the financially troubled timber industry. The media group looking at a 300 year old Mountain Ash, (centre) which has Leadbeater's Possum nesting hollows. But critics fear reforms will not go far enough after studies showed the possum has insufficient habitat for long-term survival. Many want a new highlands national park that would protect habitats from further logging. Forests in the central highlands are the last main home for Leadbeater's possums, but also a primary logging area. Exact numbers of the possums in the highlands are unknown, but are likely to be fewer than 2000. Australian National University ecology expert David Lindenmayer said logging was the main threat to the species' survival because it reduced habitats and made forests more flammable. He said 30 years of forest research showed the only way to stall the species' extinction trajectory was to declare a national park. Victoria's state-owned timber company VicForests said it would strengthen its conservation codes, but locking up the central highlands would be a ''simplistic notion to what is ultimately a complex problem''. ''There are long-term challenges for the possum which would exist if we harvested timber or not,'' spokesman Nathan Trushell said. The decision to log Mount Cole State Park (''Green anger at go-ahead for state forest logging'', 21/9) shows the gulf between the state government's actions and community expectations. In 2010, a National Parks Association report, ''Better Protection for Special Places'', listed Mount Cole as the Central Victorian reserve in most need of additional protection, based on the park's high-quality vegetation and diversity of wildflowers, including species such as the vulnerable Grampians bitter-pea. Mount Cole was also home to a range of vulnerable animals rare in Victoria, such as the powerful owl and brush-tailed phascogale. The state government's continued assault on our environment does not meet modern standards of environmental stewardship. The Napthine government will reopen commercial logging in the Mount Cole state forest near Ararat in the first significant step towards increased timber cutting in western Victoria. Agriculture Minister Peter Walsh on Friday announced he was seeking expressions of interest from foresters to harvest 3000 cubic metres of sawlogs in the Mount Cole forests over three years. The decision follows a one-year harvesting ''trial'' at Mount Cole launched in late 2012 that allowed 600 cubic metres of wood to be taken through silvicultural harvesting and the salvaging of trees felled by storms. Mr Walsh said the new Mount Cole logging licence was small-scale, but would create ongoing jobs in harvesting, hauling and processing of timber. He said 20 of the 4000 hectares of forest in the region that was suitable for sawlogs would be harvested each year. Before last year's trial, logging had not occurred at Mount Cole since 2004. The government has also recently completed a tender for increased logging in ironbark and sugar gum forests near Bendigo, and will issue new licences for sawlogs in the red gum forests of the Mid Murray and Horsham regions when old ones lapse. It follows the recommendations of a government-commissioned review into logging rates in western Victoria, also released on Friday. Green groups hit out at the decision, with Nick Roberts, a campaigner with the Victorian National Parks Association, saying the report was a wish list from local timber interests wanting access to western Victorian forests. ''The industry was paid millions to exit these forests 10 years ago,'' he said. But the timber industry welcomed the move, with Victorian Association of Forest Industries chief executive Lisa Marty saying that allowing harvesting at two-thirds of the sustainable level of Mount Cole was ''a good example of setting a balance between ecological, social and economic values''. Much of the large-scale commercial native timber logging in Victoria takes place east of the Hume Highway in the forests of Gippsland and the Central Highlands. Large-scale logging in western Victoria - notably in the Otways forests - was phased out by the previous state Labor government, with plantations and a handful of native firewood cutters remaining. But since coming to power in 2010, the Coalition-led state government has flagged it wanted to see a boosted timber industry in western Victoria. An internal note from the former Department of Primary Industries, seen by Fairfax Media, says after timber harvesting was scaled down in the early 2000s, several areas in western Victoria had been left ''underutilised''. The review identifies other areas that could be opened up to small increases in logging, including the Otways, although that would not occur until the timber industry is re-established at Mount Cole. But Mr Walsh said: ''While the review assessed potential sawlog yields in timber production areas across western Victoria's state forests, there are no plans for new sawlog allocations aside from those mentioned above. WASHINGTON (AP) - The Republican-controlled House Friday approved a bill to sharply increase logging in national forests - a measure the GOP said would create jobs in rural communities and help reduce wildfires that have devastated the West. The bill also would add hundreds of millions of dollars in revenue from new timber sales while reviving an industry that has shed tens of thousands of jobs in the past three decades. Opponents called the bill a giveaway to the timber industry and said it would harm water quality and habitat for fish and wildlife and jeopardize recreation areas that have become a major source of jobs in national forests. The White House has threatened to veto the bill, which was approved on a 244-173 vote. Seventeen Democrats joined 227 Republicans to back the bill. Just one Republican, Rep. Chris Gibson of New York, opposed the bill. The Obama administration says the measure would jeopardize habitat for endangered species, increase lawsuits and limit the president's ability to create national monuments. The bill as passed has little chance of approval in the Democratic-controlled Senate, although senators have not ruled out adoption of a forest management bill. Keith Chu, a spokesman for Sen. Ron Wyden, D-Ore., chairman of the Senate Energy and Natural Resources Committee, said Wyden "agrees it's time get the (timber) harvest up, to create more jobs in the woods and make forests healthier." Wyden plans to introduce a forest bill this fall, Chu said, but added: "It's clear that bills that undermine bedrock environmental laws or turn large swaths of federal land over to private ownership cannot pass the Senate or be signed into law by the president." The House bill's sponsor, Rep. Doc Hastings, R-Wash, said wildfires burned 9.3 million acres last year, while the Forest Service only harvested timber from about 200,000 acres. "We burned 44 times more acres than we've managed," Hastings said. "Imagine the carbon imprint" of those wildfires, which are fed in part by overstocked forests. Rep. Greg Walden, R-Ore., said many rural counties in Oregon and other states "are literally on the brink of bankruptcy sitting next to national forests" where increased timber sales could provide a lifeline. "They're choked with smoke, and their economies are choked" by policies that prevent logging, Walden said. Environmental groups criticized the bill. "They're viewing our national forests as big ATM machines that they can just level out to fill county coffers," said Noah Matson, vice president of Defenders of Wildlife, an environmental group. Increased logging "is not a sustainable, long-term solution" to economic problems in the rural West, Matson said, adding that an increase in logging jobs could be offset by a decrease in outdoor recreation jobs that have increasingly come to dominate rural Western economies. The bill includes a provision developed by members of the Oregon delegation to turn over half of federally controlled lands in western Oregon to a state-appointed trust that would manage them for timber production. The other half would be managed for fish and wildlife habitat, including creation of new wilderness areas. The measure also includes a federal subsidy for timber-dependent counties until the logging revenues start to come in. The bill makes logging a requirement on some public forestland, speeding up the timber sales process and making it more difficult for legal challenges to be filed. If enacted, the bill could again result in clear-cutting of national forests, Matson said, calling that a return to misguided policies that harmed wildlife and the environment for generations. The Congressional Budget Office estimates the bill would increase revenue from timber sales by about $2 billion over the next 10 years, with a net gain to the government of about $269 million over that period. The Greens and Professor Tim Flannery will back the creation of a new national park in Victoria's highland forests as part of efforts to save the endangered Leadbeater's Possum at a public forum on Thursday. At an event in Melbourne the Greens will launch a campaign to establish the Great Forest National Park to protect Leadbeater's and other species in the bushfire ravaged highland forests, also a major logging area. The new national park was first proposed by ANU ecologist Professor David Lindenmayer – who will also speak at the event alongside former Greens leader Bob Brown and Professor Flannery. Fairfax Media reported this month that cabinet–in–confidence scientific advice to the state government had found the current habitat set aside for the Leadbeater's possum was not large enough to ensure its survival. The possums lost 42 per cent of their habitat in the Black Saturday bushfires. Conservationists say continued logging in the region has exacerbated the species' decline. Estimates of the remaining populations of the Leadbeater's possum range from 1500 to 3000. The Greens say they will push for the new national park at both the state and federal level. National parks are largely the domain of state governments. The Napthine Government has formed a committee headed by loggers and the zoo to make recommendations on how to save the species. Professor Flannery told Fairfax Media current Victorian government policy was dooming the species to extinction and he backed the national park proposal as a way to change that trajectory. 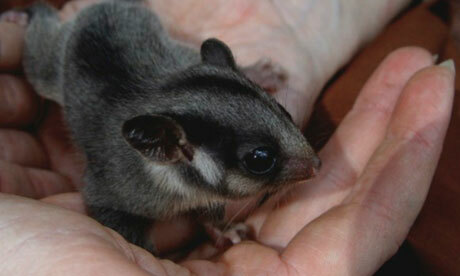 ''We have a legislative and a moral obligation to preserve [the Leadbeater's possum],'' he said. Victorian Greens Senator Richard DiNatale said Australia had one of the poorest records in the world when it came to loss of biodiversity and species extinction. ''The government-owned company that logs Victoria's forests gets free land and free trees but it still manages to make a loss. It's economic and environmental lunacy. Creating a national park would create sustainable jobs and give our precious state animal emblem a chance of survival,'' he said. As part of its environment election platform the Coalition has vowed to establish a threatened species commissioner. The Coaliition's environment spokesman Greg Hunt said the commissioner would prepare, implement and monitor recovery plans for threatened species. Tasmania's Upper House MPs are considering a critical report on the Government's efforts to address problems with the implementation of the forest peace deal, as they prepare to vote on its future. A progress report released last month found the success of the deal was being hampered by a "critical" shortage of wood. The Resources Minister, Bryan Green, has tabled the Government's response in Parliament. It includes correspondence with Forestry Tasmania, showing the state-owned company now expects to exceed wood supply targets this financial year as it ramps up a technique called cable harvesting. It also hinges on no more harvesting contractors leaving the industry. The report confirms a specialty timber supply target will not be met but says a $2 million review into the problem is progressing. At the same time, Independent Liberal MLC Tony Mulder is pushing for the Upper House to vote on the future of the peace deal legislation as soon as possible. The Member for Rumney's motion to create another 380,000 hectares of forest reserves is designed to counter Huon MLC Paul Harriss' attempt to kill off the deal. Mr Harriss wants his motion debated after the Federal election. But Mr Mulder says Tasmanians are sick and tired of political grandstanding over the issue. "The important element of this is that the issue gets decided by Parliament and not left in limbo." Industry, union and green groups that signed the historic agreement are pushing for a vote this week, and they want it to pass. Terry Edwards from the Forest Industries Association says the government's response to problems raised in the progress report should prompt the Upper House to approve the final stage of the peace deal. "This has been hanging over the industry like the Sword of Damocles now for three years," he said. "We need to bring it to a close, we need certainty." Jane Calvert from the Forestry Union says her members need certainty. "This has to be done and dusted this week," she said. "Our members have been well aware from the first day of this that there will be job losses. Never the less they have supported it because the alternative to them was devastating job losses." Debate on Mr Mulder's' motion to accept the protection of another 380,000 hectares of forest could start as soon as today. The Napthine government has announced it will set up a committee to investigate ways to save the endangered Leadbeater's possum. Unless the government defers all logging in the Central Highlands until after the committee has delivered its findings, this action reeks of hypocrisy. Several coupes of the best remaining Leadbeater's habitat are due to be logged in the next few weeks. If this is allowed to happen, it will render the committee and its decisions irrelevant. 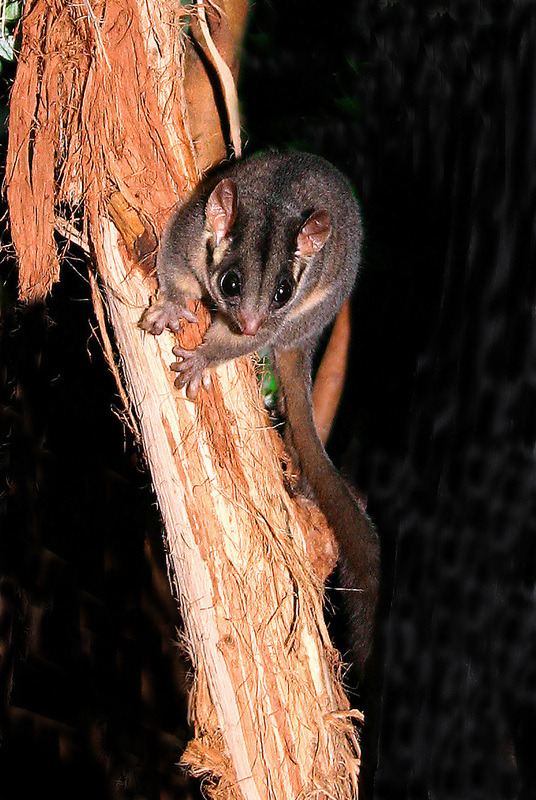 The Gymnobelideus leadbeateri, or Leadbeater's possum, is a small and precious creature that has been this state's animal emblem for the past 42 years. The trouble is, there are so few Leadbeater's possums left that their emblematic form may soon be the only way left to see them. According to a state government-commissioned report obtained by The Age last week, the species has insufficient forest habitat to ensure its long-term survival. This follows the loss in the Black Saturday bushfires of about 45 per cent of the Leadbeater's' permanent central highlands reserve, which is also a primary logging area. Also under threat is another state emblem, the helmeted honeyeater, whose numbers in the wild have fallen to as low as 60. Another report, by the Victorian Environmental Assessment Council, recommends establishing a 3000-hectare conservation area on Melbourne's eastern fringe. This would resolve only part of a far wider problem: with so many species threatened with extinction, which can or should be saved? This requires governments to start consulting animal, environment and development groups. In a federal election campaign woefully short on environmental policies from the two main parties, this could be a good time to start that dialogue. Former state governor and Olympic legend John Landy has joined a group of eminent Victorians urging the Napthine government to abandon moves to open up national parks for tourism development. In an open letter sent to Premier Denis Napthine on Sunday night the group, which also includes Nobel prizewinner Professor Peter Doherty, hit out at the development plans, which will be debated in State Parliament this week. The letter, titled Privatising Our National Parks - A Betrayal of Public Trust, says allowing tourism development is risky, deprives Victorians of their public land and is not in keeping with the environmental values of national parks. The state government is opening up two-thirds of national park land for ''nature-based'' tourism development - including low-rise hotels, restaurants and jetties - and has called for potential developers to come forward. Under the changes, the government will grant leases in parks such as Wilsons Promontory and the Grampians to private companies for up to 99 years. Projects will need approval from the environment minister before they go ahead. ''In reality, a 99-year lease transfers ownership of a public asset, something we all own and can share, to a private benefit enjoyed by a privileged few,'' the letter says. Also among the 21 signatories are former Australian of the Year Sir Gustav Nossal, retired Family Court judge John Fogarty, and founder of SANE Australia Dr Margaret Leggatt. The group points to the troubled tourism project at Seal Rocks on Phillip Island in the 2000s - which resulted in the state government being sued, costing taxpayers $55 million - as an example of what could go wrong. ''Low-risk, attractive development could be encouraged in outstanding locations just outside our national parks,'' the letter says. Another signatory, RMIT Professor Michael Buxton, said national parks were more crucial than ever in conserving biological diversity and landscapes. ''But on a broader level what worries me is this is part of a systematic destruction of the conservation state and environmental policy by this government,'' Professor Buxton said. We mourn the loss of the dodo and Tasmanian Tiger as well as countless beautiful creatures that have been wiped from this planet. We excuse these losses as being due to our forebears' ignorance. But it's now 2013 and the Napthine government is set to tip entire species into the extinction pit with full scientific knowledge (''Possum needs more room to survive'', 16/8). Ignorance is not the reason now; shameless greed and political expedience is. Our governments care more for the protection of their corporate partners than our natural areas and wildlife. Entire species found nowhere else in the world are due to be executed because of their crime of living in the woodchip zones of Victoria's woodchip, pulp and paper industry. Victoria's endangered faunal emblem, the Leadbeater's possum, has insufficient habitat to ensure the species' long-term survival, a leaked report commissioned by the state government has found. The findings have potential implications for Victoria's timber industry, with the cabinet-in-confidence report suggesting tens of thousands more hectares of forest habitat is needed to give Leadbeater's the best chance of avoiding extinction. The research - from the state government's Arthur Rylah Institute - investigated the status of threatened species in the central highlands forests, which were ravaged by the Black Saturday bushfires. The highlands are the last main home for Leadbeater's, but also a primary logging area. 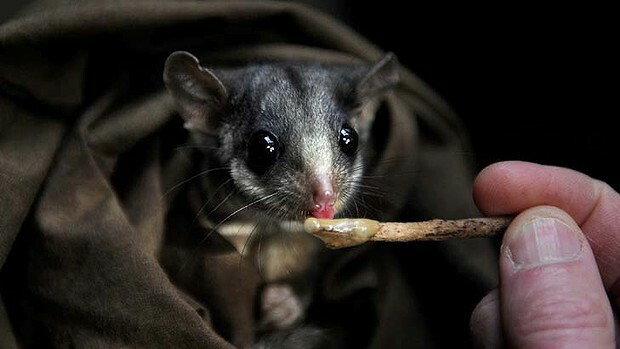 Conservationists and scientists say logging has contributed to the possum's decline. The timber industry says fire is the predominant problem. Institute researchers surveyed 180 sites throughout the highlands, finding Leadbeater's at just 29 locations. None were found at any of the 30 surveyed sites burnt during the 2009 fires. All up, 45 per cent of the Leadbeater's 30,500-hectare permanent reserve was burnt in 2009. The report does not include an estimate on possums populations. ''The analysis predicts that the population of Leadbeater's possum within the reserve system has a high likelihood of being at a very low population size, which imposes on the species a greater risk of extinction, and that the existing reserve is insufficient to ensure the long-term persistence of the species,'' the report says. The report also determined the chances of the species maintaining a population of 500 females, considered critical for survival, in different habitat sizes. It found 46,000 hectares of unburnt, viable Leadbeater's habitat exists in reserves and national parks, of which the animal likely occupies about 15,000 hectares. To have a strong survival chance, 56,000 hectares is needed under a best-case scenario of no bushfires. Otherwise, the area needed increases to 67,000 to 171,000 hectares. ANU forest expert Professor David Lindenmayer this week called in a public speech for a new highlands national park to be established. But when contacted he refused to comment on the report citing a confidentiality agreement, as did other authors and contributors. 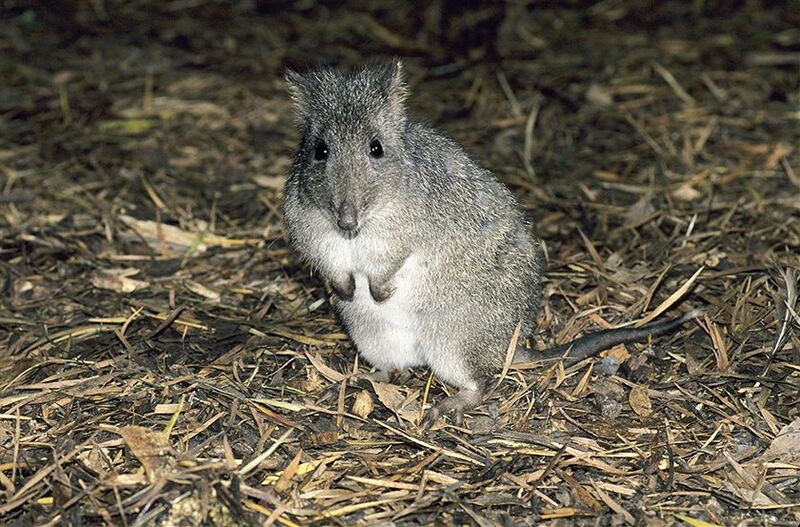 The researchers also studied the viability of long-footed potoroos in East Gippsland - another logging area - finding reserve systems alone are insufficient to ensure the species' conservation. The state government has formed a Leadbeater's advisory group, headed by the timber industry and Zoos Victoria, to consider issues such as the size of habitat reserves. A government spokesman said it expected the report to be made public in the near future. MARK COLVIN: Last night we ran an interview with the leading expert on Victoria's faunal emblem the Leadbeater's possum who warned of the creature's likely extinction. Professor David Lindenmayer of the ANU draws on more than 30 years of work in the Victorian Ash forests studying the possum. He argued among other things that a new national park was needed to protect the Leadbeater's possum, because without areas completely free of logging, it had no chance of survival. We said then that we'd be seeking a substantial response from the Victorian government tonight. Today, the Victorian Environment Minister, Ryan Smith, declined our invitation to appear. He referred us to the Agriculture Minister, Peter Walsh, who was also unavailable. PM then approached the Premier's office, but he too declined. 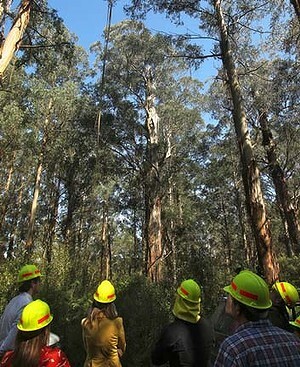 Mr Walsh's office suggested we talk instead to the loggers' peak body, the Victorian Association of Forest Industries. Its Chief Executive is Lisa Marty. LISA MARTY: Look I, I think given the impact of the 2009 bushfires, which burnt 45 per cent of the Leadbeater possum reserve area, the survival of the Leadbeater possum is a concern for many Victorians, certainly including those in the forest and wood products industry. MARK COLVIN: You don't accept what Professor Lindenmayer says, that it's the effect of both logging and bushfires? LISA MARTY: Look I think there's a range of challenges facing the Leadbeater possum, but overwhelmingly the impact of the 2009 bushfires has made the situation very critical. As an industry and certainly as the Victorian Association of Forest Industries we're committed to responsible forest management and to the recovery of the Leadbeater possum alongside a sustainable local forest and wood products industry. MARK COLVIN: And critical means urgent doesn't it? I mean what's being done in the very short term? LISA MARTY: It is about the short term future of the Leadbeater possum but it's also about the future of the possum in the long term. David Lindenmayer's work does show that over time there are a range of challenges facing the possum; so there are both short and longer term challenges. MARK COLVIN: But this advisory committee, this Leadbeater's Possum Advisory Group, when is that going to produce any real results? LISA MARTY: The group has been requested to provide recommendations back to the government before the end of the year. It's quite a short timeframe but we will be drawing on the latest science, including the work of Professor Lindenmayer, as well as the outcomes of recent work by the Arthur Rylah Institute, which was commissioned by the Victorian government, last year as well as the contributions of stakeholders. MARK COLVIN: Well he tells me that he's been writing to the government and has had really no response, is he going to have any guarantee of being properly listened to by this group? LISA MARTY: Certainly. It is absolutely crucial that the work of respected scientists such as Professor Lindenmayer, the scientists at the Arthur Rylah Institute, forest scientists, social scientists, provide concrete recommendations to the advisory group to draw on alongside the contributions of key stakeholders. MARK COLVIN: What about his proposal that there should be a new national park; that there should be an area which is specifically reserved from logging because he says that's the only way the Leadbeater's possum, which is the emblem of Victoria, is going to survive. MARK COLVIN: But isn't it fair to say that the Forest Industry Association and its previous iterations have always opposed any attempt to lock off more land for the protection of the possum? LISA MARTY: Look I think in reality there has been an increase in reserves for the possum. It's very unfortunate that along with the impacts on the community of the 2009 bushfires, 45 per cent of the Leadbeater possum reserve area was effected. And unfortunately the Leadbeater possum has been shown to be incredibly fire sensitive and does not continue to exist in the areas which have been effect by fire; so that is really driving a more critical situation. MARK COLVIN: You would have heard your predecessor, Robert Bain, of the Forest Industry Association last night on the Four Corners program in 1991 saying that he was not worried in the sense that good management would maintain a healthy population of Leadbeater's possum. And he told me at the time it would be alright because they'd be putting in nesting boxes. Now David Lindenmayer says that he did a 10 year study on that nesting boxes idea and the possums simply don't use them. So why would your optimism now be anymore well placed than his then? MARK COLVIN: That means that you have to have what they call "stag trees" those are the old trees that have the big old hollows in them. MARK COLVIN: And the pattern is, isn't it, that the foresters have tended to clear fell them and not leave enough for the possums? LISA MARTY: Look there are a range of prescriptions in place at the moment to protect Leadbeater possum habitat. Obviously this is a challenging situation and we need to look at what needs to be done in the future, certainly we can look back and we need to learn from the past. But we need to understand based on the work of key scientists right now, what do we need to be doing in the future to ensure the recovery of the Leadbeater's possum. And we certainly believe that the sustainable local timber industry can co-exist. MARK COLVIN: Lisa Marty, the chief executive of the Victorian Association of Forest Industries. After decades of conflict, sometimes fought tree-by-tree, chainsaws have been stilled in the old growth forests of Tasmania's world heritage wilderness. The boundary described by federal Environment Minister Tony Burke as Australia's most contentious heritage line was settled on Monday when UNESCO's World Heritage Committee backed protection. About 120,000 hectares of old growth forest was formally included in a 170,000-hectare expansion of the existing Tasmanian Wilderness World Heritage Area, giving those trees the highest level of conservation, Mr Burke said. Campaigns to protect the forests of the Weld, Styx, Florentine and Great Western Tiers have been under way for more than 30 years. Conflict over logging has involved many blockades, street rallies by thousands on each side, assaults on environmentalists, and the loss of logging machinery to fire-bombing. In one individual protest, teacher Miranda Gibson spent a national record 457 days atop a tree in the Styx before nearby bushfires forced her down in March. ''Today I think of the wedge-tailed eagle that I watched fly above my tree, whose habitat was once under threat and is now protected, and of the Tasmanian devils who lived in the forest 60 metres below my platform who can now raise their young in peace'' Ms Gibson said. The world heritage nomination was the centrepiece conservation achievement of three-year peace talks between industry and green groups, forced by a collapse in native timber markets. A key participant in the peace process, Vica Bayley, of The Wilderness Society, said the extension finally recognised these forests as global treasures. But it does not spell the end of environmental conflict in Tasmania, as division widens over the Tarkine region of the state's north-west. Bob Brown, who drove early forests campaigns and became national leader of the Greens, recently became patron of the Save the Tarkine movement, which is blocking mining in the Federal Court. Malaysia has declared a state of emergency in two parts of the southern state of Johor as smoke from land-clearing fires in Indonesia has pushed air pollution above the level considered hazardous. The illegal burning of forests and other land on Indonesia's Sumatra island to clear space for palm oil plantations is a chronic problem during the June-September dry season. 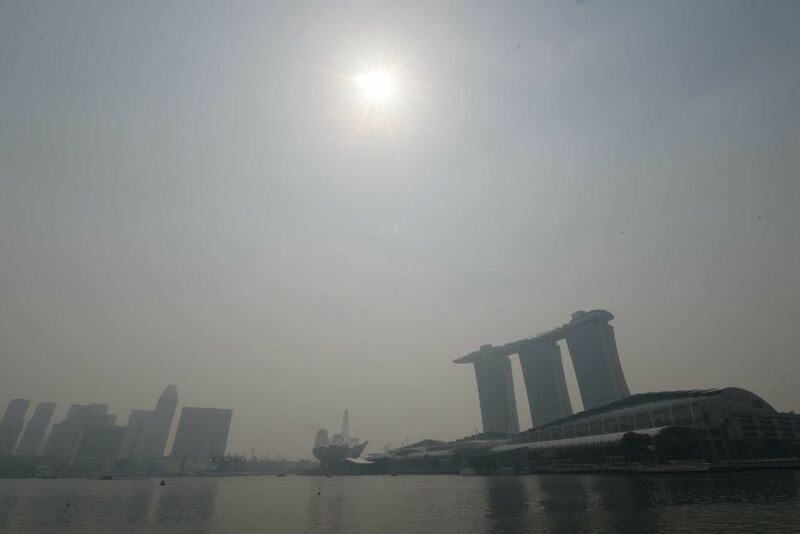 The "haze" caused by fires on Sumatra has also shrouded neighbouring Singapore, but air quality in the city state has improved over the weekend after reaching hazardous levels. Malaysia's minister for natural resources and environment, G. Palanivel, announced the state of emergency in a Facebook post. "Prime Minister Najib Razak has agreed to declare emergency status in Muar and Ledang with immediate effect," he said. Mr Palanivel's post said the air pollution index had exceeded 750. Any reading above 300 indicates hazardous air pollution. The Johor state operations centre says residents in the affected areas of Johor state, Muar and Ledang, have been advised to stay indoors. It was the loophole you could drive a truck through. A $44 million federal government bailout of struggling logging contractors has ended in angry dispute. 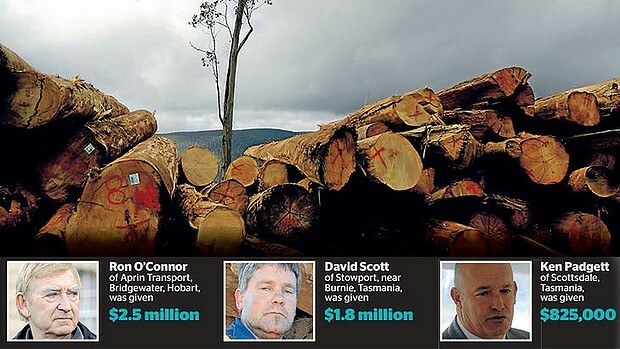 The taxpayer cash was meant to ensure that operators who cut and cart timber could pay their debts and leave the collapsed Tasmanian native forest logging industry. Instead, some ''phoenixed'' their businesses, a Senate committee has heard. After companies closed and payouts were made, new businesses rose from the ashes under the control of other family members. Now competition between the survivors is even more cutthroat. A list compiled by industry insiders and seen by Fairfax Media raises questions about 20 of the 61 contractors to receive payouts, at least nine of whom are said to have other family members doing business in native forests. Separate compliance and fraud teams have been established to manage and investigate the Intergovernmental Agreement Contractors Voluntary Exit Grants Program, (IGACEP), according to a spokesman for Forestry Minister Joe Ludwig. In the spotlight is a Department of Agriculture, Fisheries and Forestry deed poll requiring an undertaking that for 10 years, grant winners will not use their equipment or work in the native forest sector - except as an employee. Industry leader Ken Padgett won $825,000 under the IGACEP and said he was out of native forest. But Mr Padgett, who still employs 45 people in Tasmania's north-east, said he would not have taken the money if his sons had been precluded from working in native forests, should they choose to. He agreed with Senator Milne in a Senate committee hearing that this was ''succession planning writ large''. ''An older person can just take the money, refinance the business, and hand it over to the sons,'' Senator Milne said. In the state's central highlands at Ouse, contractor Wally Triffett told Fairfax Media the $811,800 he received was used to settle his native forest logging business. He said he gave his son his last Kenworth log truck and now did civil earthworks himself. ''It's terrible what people have done,'' Mr Triffett said. One of the state's biggest log haulers, Aprin Pty Ltd, won $2.5 million to leave native forests. Aprin principal Ron O'Connor operates from the same yard near Hobart as Timber Marshalling Services (TMS), run by his son Brendon O'Connor. TMS was contracted this year to cart logs for the state public forest agency, Forestry Tasmania. Neither man responded to calls. The failure of successive federal government attempts to boost the industry shows in a comparison of grants to contractors who first won big handouts to retool for plantation work, then later were given money to leave the industry. DAFF documents show that Aprin was a $1.05 million beneficiary of a retooling program to move out of native forests four years ago. An Ernst & Young study of a $54 million Howard government program said DAFF files were so deficient that in 60 cases there were no audited statements supporting grant applications. These cases therefore lacked a basic proof that the grantees needed a grant. With birds providing a nonstop soundtrack, the rugged 10-mile trail wanders deep into the forest’s lush backcountry, mercifully far away from iPhone service and the rest of civilization, giving hikers plenty of time to think about anything. As I winded my way through the trail Thursday morning, getting lost a time or two but never minding, one thought kept popping up over and over. Why in a state with a short supply of natural beauty, one without the mountains or plains or oceans that grace so many other states, are Indiana government officials so eager to bring loggers and their chainsaws into places such as Morgan-Monroe with increasing frequency? In case you missed the story, which the state has done its best to underplay, DNR is taking another big step in the most aggressive logging plan in state forests in decades, targeting the backcountry areas that environmentalists, hikers, birdwatchers and others value so much. Morgan-Monroe, just 45 minutes south of Indianapolis but a world away, is on the latest list, as is Yellowwood State Forest. It’s all part of a dramatic increase in state forest logging that began during the Daniels administration and looks certain to continue under Gov. Mike Pence. But why? To please the politically connected logging industry, which counts key legislators as its friends but has so much private land on which to work? To raise money for the state, roughly $2 million annually, according to DNR? It doesn’t make sense. That’s not to argue against logging in general, or against the need for smart timber management. But this ongoing effort to invade state forests is just another example — along with over-the-top protections for factory farms and attacks on industrial regulations — in the never-ending disregard for basic environmental protections in Indiana. As I walked around Morgan-Monroe State Forest on Thursday, hundreds of trees in my field of vision at every step, it was hard to imagine anyone having the thought that, ‘Hmm, there are just too many trees.” Or that anyone would wish to destroy the most mature trees in the forest, which loggers have their eyes on in particular. But this is more important than spoiling a good walk. In its newsletters in recent years the timber industry has celebrated elections that have put friendly faces into key government spots — from legislative committee chairmanships to the governor’s office. Over that time, timber harvesting on state land has increased by up to 400 percent, DNR spokesman Phil Bloom said, though he added that only 1 percent of the land is harvested each year. Bloom made several arguments in favor of logging as we talked and shared emails in recent days. He said the removed trees would be replaced with new planting and that the money raised funds forestry programs, including the purchase of new land. “Timber harvests create forest openings that foster new growth, greater diversity of growth, and habitat beneficial to some woodland wildlife species,” he said, offering a case that clearly many people accept. When the backcountry areas were established in 1981, he noted, pointing to a news release at the time, timber harvesting was part of the plan. Environmentalists question whether it was as big a part of the plan as it is becoming. The question is when will the increase in logging stop, and when will environmental concerns begin to get a seat at the adult table when decisions are made. Logging has increased to this point with little outcry from Hoosiers and at absolutely no political cost for former Gov. Mitch Daniels and now Gov. Mike Pence. If bumping the figure up to 1 percent of state forests is acceptable, will anything change if, and when, that figure doubles or triples? Indiana has its strengths and its weaknesses, both now and in its long history. And one of its consistent weaknesses has been an unwillingness to protect its environment. I’m not talking about an Oregon-like belief in placing environmental concerns at the top of the list of every debate, but rather just a basic understanding that clean air and water, open spaces and reasonable controls on industry and factory farms, can add much to the quality of life. But that’s the point. They shouldn’t have to. In Indiana, the old issues still haven’t received their due. Singapore's smog index has passed the critical 400 level, making it potentially life-threatening for people who are ill or elderly. The record level was reached at about 1:00pm AEST after a rapid rise in the Pollutant Standards Index (PSI), which measures the haze crisis caused by Indonesian forest fires. Indonesian and Singaporean officials have been holding emergency talks on how to extinguish the fires on farms and plantations on Sumatra island, which are also affecting Malaysia. 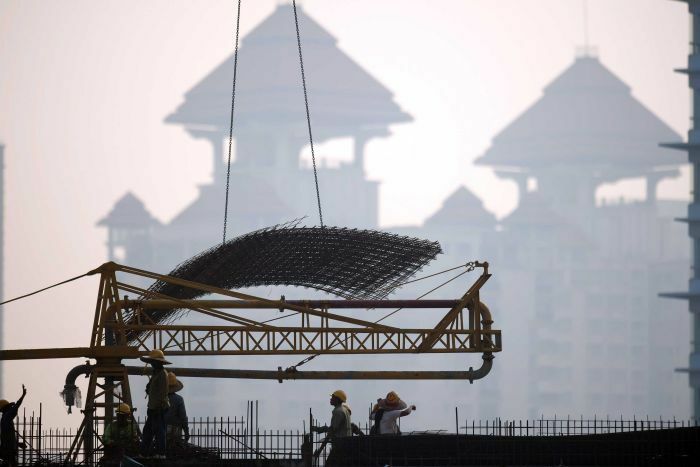 Meanwhile, Indonesia has sent helicopters to create artificial rain in an effort to fight the fires that are causing the smog in Singapore and Malaysia. General practitioner Philip Koh said he had seen a 20 per cent spike in consultations in the past week. Mr Koh estimates about 80 per cent of his patients are suffering from haze-related ailments. Mr Koh said many people were turning to his clinic to buy protective masks, as supplies are low at retailers. "Our supplies are running low here too," he said. Ashleigh Nghiem, an Australian producer working for the BBC in Singapore, has spoken to Radio Australia's Asia Pacific about the condition in the city's Central Financial District. "There are people coming out from work and many of the commuters here tonight are wearing face masks," she said. "Four days ago, when this crisis began, hardly anyone was seen wearing a facemask. "Now, people are doing what they can to protect themselves because they just don't see any way in which this smog is going to be cleared soon." The government has advised all children, elderly people and persons with existing diseases to stay indoors, keep windows closed and avoid physical exertion if the 400 index average is sustained over a 24-hour period.